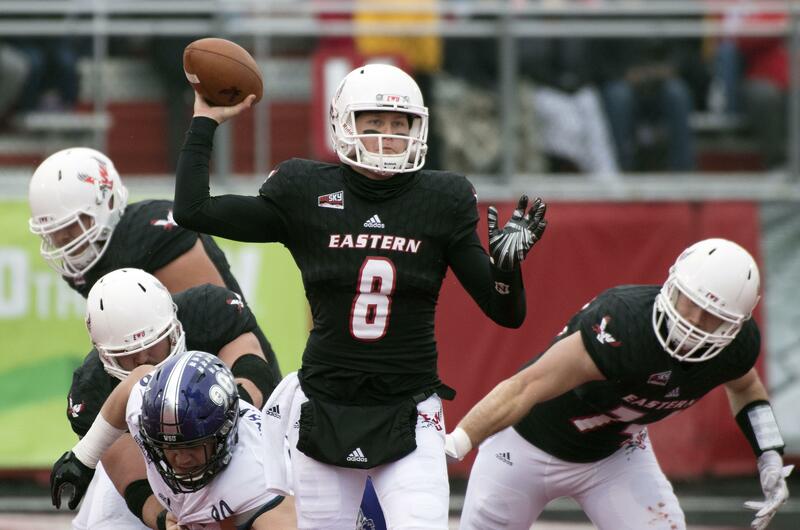 Seven months after an FCS playoff snub, prognosticators have forecast success for the Eastern Washington football team in 2018. HERO Sports, Athlon Sports and Street and Smith’s magazine have the Eagles ranked No. 4, No. 6 and No. 14, respectively, in their recent Top 25 preseason polls. Eastern finished 7-4 in 2017 and 6-2 in Big Sky Conference play. Eastern quarterback Gage Gubrud, one of the most productive offensive players in the FCS the last two seasons, was named a preseason All-American by HERO and Athlon. The senior from McMinnville, Oregon, is one of 16 returning starters for Eastern. “It’s awesome to see that those student-athletes have put in the work to seem themselves in this preseason situation,” said Aaron Best, Eastern’s second-year head coach. “Whether it’s No. 4 or No. 24, you like to see yourself recognized, because confidence plays. Eight Big Sky Conference teams were collectively recognized in the three polls, including Idaho, which was ranked No. 23 by HERO in its return to FCS football. HERO, a website that provides content and analysis for FCS and small-college football divisions, also ranked defending Big Sky co-champion Weber State (18) and UC Davis (22). Athlon, a longtime pro and college sports preview magazine, ranked Weber State (9), Montana (18) and Sacramento State (23). Street and Smith’s, another longtime preview magazine, ranked Weber State (7), Northern Arizona (16) and Sacramento State (19). All three publications voted North Dakota State No. 1. The Bison have won six of the last seven FCS national championships. The Big Sky Conference media and coaches preseason polls will be released in July. Eastern opens its season Sept. 1 against Central Washington at Roos Field. Idaho opens its season the same day at Fresno State. Published: June 15, 2018, 3:37 p.m. Updated: June 15, 2018, 5:02 p.m.